*Free admission but bring cash for purchase. The Mission Community Market will be operated by CUESA on Thursday evenings, 4 to 8 pm, rain or shine. 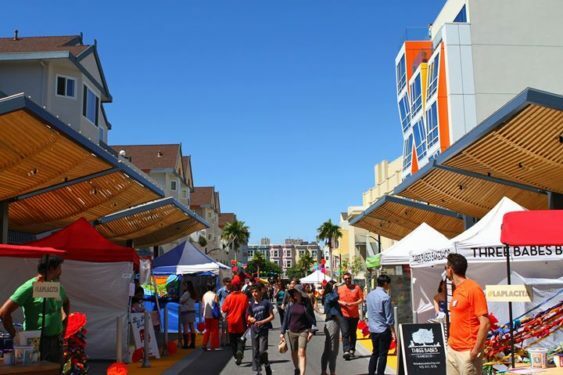 Founded in 2010, the market is made up of farmers, small local businesses, and community programs, promoting family health and creating a fun, beautiful public space for the Mission District. Starting in 2018 CUESA took over, helping support this vibrant neighborhood market with deep roots in the Mission community. How to get there: The market is accessible from the 24th Street BART station, as well as the 14, 49, and other MUNI lines. CUESA (Center for Urban Education about Sustainable Agriculture) is a nonprofit organization that is dedicated to cultivating a sustainable food system through the operation of farmers markets and educational programs. Mission Community Market returns for the 2019 season starting on Thursday, February 14. Show your love for local farmers and the Mission community this Valentine’s Day, and join for a fun evening of good food, family fun, live music, and more. Enjoy live music from Dos Bandoleros (4-6 pm) and DJ Lamont (6:30-8 pm), brought to you in partnership with Little Mission Studio. Stop by the the CUESA Kids’ Corner for Valentine’s Day card making for the whole family. Visit the CUESA Food Shed to learn about biodiversity and taste local microclimate honey. Pick up sweet treats, locally grown flowers, handmade bodycare, crafts, and other goodies from local farms and vendors. Check out CUESA’s Valentine’s Day guide. Stop by the Foodwise Teens tent to support local high school students who will be selling their school garden grown produce and handcrafted pickles.